KCTV Channel 5 in Olathe, Kan., aired a piece on Feb. 9 about need for court reporters in Kansas and Missouri. KHSB TV, Kansas City, Mo., posted a story on Feb. 8 featuring NCRA members Cindy Isaacsen, RPR, an official court reporter from Olathe, Kan., and Chris Herndon, RPR, CRI, an official court reporter from Prairie Village. 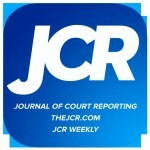 The article focused on the growing demand for more court reporters. The Kansas City Star printed an editorial on May 29 calling for salary increases for judicial employees. 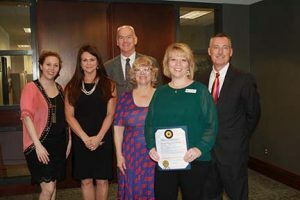 The board of trustees of the Neosho County Community College, Chanute, Kan., recently approved a certificate for court reporting. The 45-credit-hour program is for those who only want to pass the state court reporting certification, according to an article posted on April 12 by the Chanute Tribune. The Topeka Capital-Journal posted an article on March 15 about Kansas Chief Justice Lawton Nuss discussing cost of living raises for court employees during his State of the Judiciary Speech. Members of state court reporting associations across the country have spent the week celebrating their profession by participating in career fairs, visiting court reporting schools, hosting Veterans History Project events, and being quoted by local media, in honor of the 2017 Court Reporting & Captioning Week. For members of the Kansas Court Reporters Association (KCRA), however the week proved to be exceptionally busy. KCRA members kicked off the week by meeting with the state’s governor and securing an official proclamation recognizing 2017 Court Reporting & Captioning Week. In addition, representatives from the association were also invited to visit with members of the state’s Supreme Court where they also secured another official proclamation and pictures with the justices. KCRA members marched onward throughout the week with other stops. They visited with members of the State Judiciary Committee where reporters provided a realtime presentation that left the attendees mesmerized. They also visited with members of the Johnson Board of County Commissioners complete with breakfast and another realtime demonstration that led to yet another official proclamation recognizing the week. 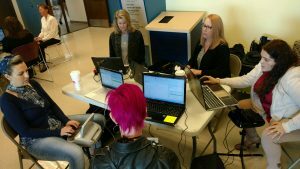 KCRA members wrapped up their celebration with a special write-a-thon at Neosho County Community College to help raise funds to aid students in its court reporting program. “It’s been a very busy week,” said Cindy Isaacsen RPR, an official court reporter from Olathe and president of KCRA. 2017 Court Reporting & Captioning Week also earned national recognition from U.S. Rep. Ron Kind (Wis.) in a floor speech before the U.S. House of Representatives on Feb. 14, and by state governors in Alabama, California, Colorado, Florida, Illinois, Iowa, Kansas, Minnesota, North Carolina, Ohio, Oklahoma, Pennsylvania, South Dakota, Washington, and Wisconsin as well as by officials in Bexar County, Texas. Other activities included visits with students at GateWay Community College in Phoenix and Bryan University in Tempe, both in Arizona. A number of members who visited with students were in the area attending the 2017 NCRA Firm Owners Executive Conference being held in Tucson. Students at both sites were able to ask the professionals questions and for advice. The panel discussion at Bryan University was open to both on-site and online students. Members of the Missouri Court Reporters Association visited with state legislators in Jefferson City when they held their annual cookie drop. “We are always warmly received and welcomed, and this time was no different,” said Linda M. Dattilo, RPR, an official court reporter from Florissant, Mo., and the association’s executive director. “They know when we’re coming, and we’ve had senators call our lobbyists and ask where the cookies are because they are waiting for them. At the end of the day, we’re always exhausted by all the running around, but satisfied, and hopefully they are too,” she added. 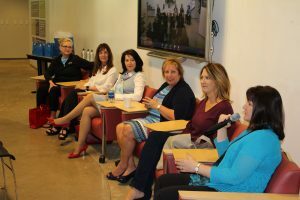 Members of the Wisconsin Court Reporters Association also promoted the court reporting and captioning professions at an open house held by North Wisconsin Technical College in Green Bay. The Andrews Gazette (Easton, Md.) posted an article about the Hard-of-Hearing Heroes Veterans History Project event that NCRF and the Hearing Loss Association of America will host on Feb. 18 in Bethesda, Md., as part of NCRA’s 2017 Court Reporting & Captioning Week. The Newton Daily News posted an article on Feb. 9 announcing that the Des Moines Area Community College, Des Moines, Iowa, is hosting several events to mark 2017 Court Reporting & Captioning Week. Among the activities will be two information sessions where prospective students can learn about the court reporting and captioning professions. In an article posted Feb. 13, the RegisterNews.com, Mt. Vernon, Ill., announced that Gov. Bruce Rauner has designated Feb. 11-18 as National Court Reporting & Captioning Week. 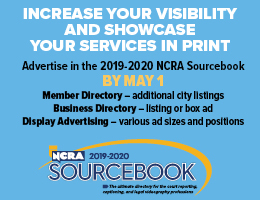 The article also noted that several court reporters from the 2nd Judicial Circuit will promote the profession at an upcoming local career fair. In a press release issued Feb. 13, Planet Depos reported that its Planet Institute, a student-to-career mentoring program, has had a successful first year. 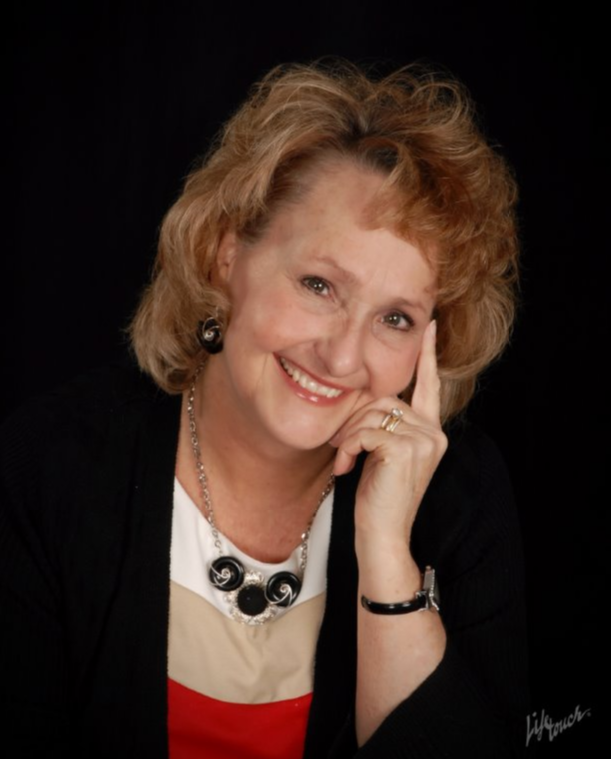 In a press release issued Feb. 10, NCRA member Ginger Baze, owner of Steno Services in Hugo, Okla., announced that her firm is launching an outreach and education campaign for National Court Reporting & Captioning Week. The Gilmer [Texas] Mirror posted an article on Feb. 13 about the Texas Supreme Court holding a formal court session to hear oral arguments in two cases at LeTourneau University in Longview, in conjunction with “Law as a Career Day” being held on campus. 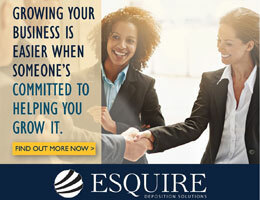 Numerous law schools, paralegal schools, and court reporting schools will have recruiting booths on-site. 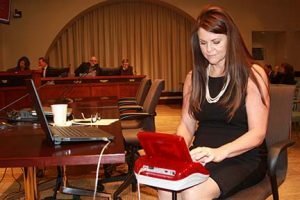 Star Levandowski, director of marketing at Stenograph, posted a blog on Feb. 3 highlighting the top three reasons to admire the stenography profession in honor of Court Reporting & Captioning Week. Read more about how national and state associations, schools, and vendors have celebrated Court Reporting & Captioning Week. You can also follow along on Facebook and Twitter.